Eccles Grange in Backworth. Picture by Julian Leigh Kenyon. An open day is being held to show off new retirement apartments. Eccles Grange, a refurbished complex of 34 one-bedroom retirement flats in Backworth created by North Tyneside Council, recently welcomed its first residents. Now the complex is holding an open day between 10am and 2pm on Saturday, October 31, for others intested in moving in. The building benefitted from a makeover as part of the local authority’s £300m North Tyneside Living project. Coun John Harrison, cabinet member for housing and transport, said: “Eccles Grange, like all the schemes we’re creating, is much different to the old traditional types of sheltered accommodation – it’s bright, contemporary and inviting. Eccles Grange boasts state-of-the-art wet rooms and kitchens, and every home has either Juliette balconies or patio doors to access the shared garden. While each apartment has its own personal lounge, there’s also a communal one and a sun lounge. There’s also a therapy room which is used by professionals, including hairdressers, and a guest apartment where family and friends can stay. Tenants who lived there before it was revamped – previously called Eccles Court – have moved back in, but the extra apartments created means there are another 14 now available to rent from the council. At the open day later this month, a show flat will be open and staff will be on hand to provide information and tours. Anyone unable to make the event can view the show apartment by appointment. The North Tyneside Living homes are available for those aged over 60. 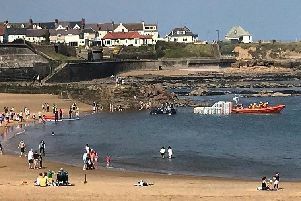 For more information, visit www.northtyneside.gov.uk or call 0345 2000 102.